KoopaTV believes in a truth & levity approach to the videogame industry for over five years. Don't you? KoopaTV also features the KoopaTV Loyalty Rewards Program for your on-site comments, as well as many other activities. Win gift cards! By LUDWIG VON KOOPA - Exclusively on Nintendo eShop for less than a week. We clearly have Ace Attorney on our mind at KoopaTV, with three Ace Attorney articles published just last month alone. (All of them are hyperlinked throughout this article.) 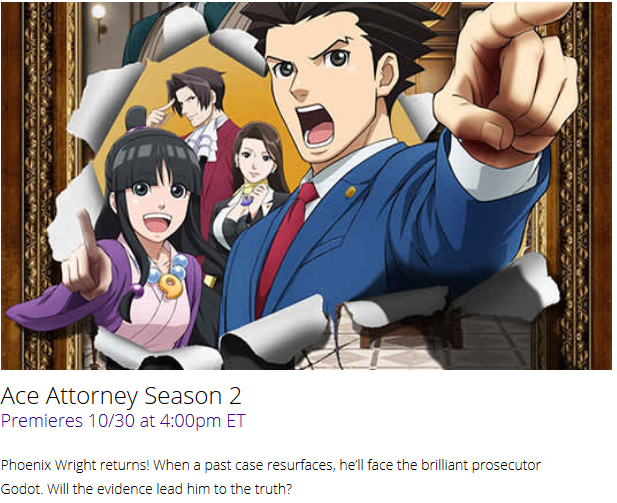 And later this month (later this WEEK, on October 6), the second season of the Ace Attorney anime is showing in Japan. It's being “simuldubbed” by Funimation as of October 30, which doesn't sound very... simultaneous with October 6. Funimation doesn't know what words mean, but, whatever, it's still getting it in English sooner than it otherwise would be. Meanwhile, CAPCOM is setting the Ace Attorney games at big discounts in the Nintendo eShop for the Nintendo 3DS. But in North America. It's NOT on sale in Japan. Some Harvest Moon or Story of Seasons games are, but not Ace Attorney. 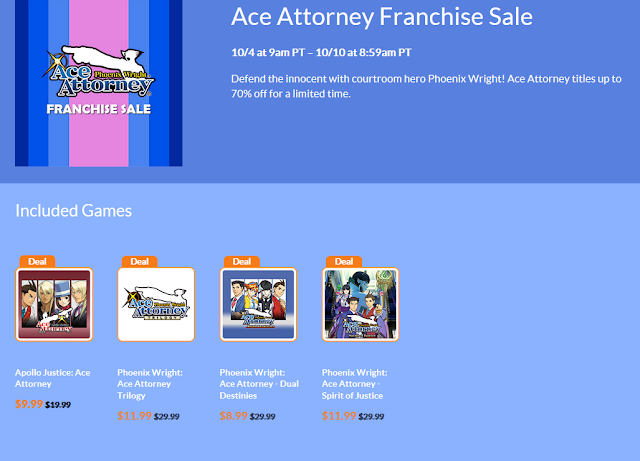 Ace Attorney Franchise Sale from October 4 to October 10. Let's try and figure out why CAPCOM would have the Ace Attorney games on sale in North America but not Japan right now. And, of course, compare how deep the discounts are! Since the special, just-for-Ace Attorney sale isn't to coincide with the anime (since it's NOT in Japan, but only in Japan will the anime show during this time period), then there is only one possibility. A possibility that's already in the KoopaTV record. Just last week, KoopaTV wrote an article about the Brett Kavanaugh hearings and we compared it with Ace Attorney in a number of ways. Guess what is still going on and may go on until the end of the sale? The fate of Brett Kavanaugh's future. Will he become the next Justice of the Supreme Court? Or will he fail and have his reputation ruined for the rest of his life? Not to mention his wife and kids. As noted in the article, Ace Attorney fans should side with Brett Kavanaugh, and more people should both be Ace Attorney fans and side with Brett Kavanaugh. CAPCOM must agree, hence the sale. Certainly, it wasn't for any business objective on CAPCOM's part. They just announced Phoenix Wright: Ace Attorney Trilogy on Nintendo Switch, Xbox One, PlayStation 4, and PC. Surely, they'd rather have people buy those games at full price, rather than at $11.99? Putting the game on sale for 3DS now probably means less full-price sales on those consoles later. Just how much are the sales? Well, as I mentioned, Phoenix Wright: Ace Attorney Trilogy is on sale at $11.99, which is 60% off. Phoenix Wright: Ace Attorney – Spirit of Justice is also 60% off at $11.99. Phoenix Wright: Ace Attorney – Dual Destinies is 70% off at $8.99. Lastly, Apollo Justice: Ace Attorney is 50% off, selling for $9.99. These are exactly the same discount figures as the CAPCOM Summer Sale from the end of July 2018. No new records here. You should follow her lead, but for all of the Ace Attorney games you haven't bought. Go on. You have until noon on October 10. ...And so do the United States Senators, to confirm Brett Kavanaugh. Remember, no evidence and no witnesses means no case. Miles Edgeworth said that, not me. Play Ace Attorney and you'll understand. There's never been a better time (besides this summer, which was an equally good time) to get into the entire Ace Attorney series, available on the Nintendo 3DS! Once you become familiar with Ace Attorney, your appreciation for everything else on KoopaTV will go up considerably. That might not sound possible, but it's true! Skip to October 30. The anime is out in English (for the first episode), and Rawk spoilers the whole Phoenix Wright: Ace Attorney: Trials and Tribulations with his experience. The CAPCOM Winter Sale 2018 has the exact same discounts as this franchise sale, but with a whole game missing. With all of these Ace Attorney articles and references lately, I am convinced that I should go back to where I left off in Dual Destinies. Once the Switch released, I have essentially placed my 3DS backlog on hiatus. I really need to finish and get caught up in the series so I will be prepared for when the next one comes out. We're gonna keep going with more Ace Attorney articles regardless. But yes, please do catch up. We embrace your comments. No identification required, but if you don't comment as Anonymous, then you will be entered into the KoopaTV Loyalty Rewards Program and may win prizes if you keep up activity! Expect a reply between 1 minute to 24 hours. We advise you to receive an e-mail notification for when we do reply. Spamming is bad, so don't spam. Spam includes random advertisements and obviously being a robot. Our vendor may subject you to CAPTCHAs if you are not using a Google account. We're not happy about that, either. TAKE THAT! Phoenix Wright Revealed For Super Smash Bros. Ultimate Fighter Pass DLC! Nintendo, could your eShop card activation code be a little bigger font size? FAKE NEWS on Nintendo Directs... and Stage Builder? The NeoGAF Liberation! Right or Wrong, NeoGAF is Ruined! Spring Fest Splatfest: Hare vs. Tortoise: The Rematch! Who Wins? Is Yoshi's Crafted World a Must-Buy? Round 1 Picks: GameFAQs Character Battle X! Are People Angrier At Spin-Offs Now Than Before? Copyright Planet Koopa 2013-2019. All copyrights belong to respective owners. Powered by Blogger.